Does Your Local Government Need A Drone? If you just think about having a small unmanned aircraft and what you could do with it, all kinds of things may come to mind. How about getting some current imagery of that new subdivision, on the cheap? Getting some photos of that antenna array up on the water tower without having to climb it? Perhaps getting some hard lat/long anchor points on that new parcel split? To help with a bit of insight, below is an image from the Horizon ground control station software (by MicroPilot) showing flight path waypoints and areas of operation. In this image, the area in the upper right, highlighted in yellow, is restricted airspace. The pink and green are waypoints for both navigation and geo-referencing. The base imagery or map can come from your own files (maps and imagery), or you can even use Google Earth. 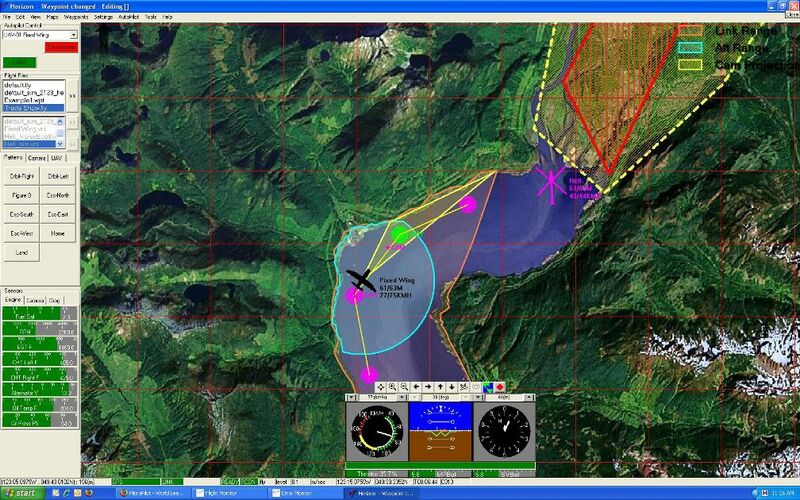 This image is courtesy of MicroPilot from its Horizon ground control software. However, as with any newly-adopted technology, there are issues to consider. Drones and unmanned aerial vehicles (UAVs) have gotten a bad rap in the press as well as lots of concern from citizens around the privacy issue. In order to put it into perspective, let's look at the basic issues that confront UAVs, unmanned aerial systems (UASs - like UAVs, but include all the sub-systems) and drones. Safety: The common fear is that you will crash your drone into a crowd of spectators causing them injury. While this is possible, your drone will not be very large or heavy. Many UAVs are less than five pounds and are traveling at less than 25 mph. Most have a failsafe mechanism that releases a parachute, puts it into automatic hover and even returns home to automatically land if the control link is lost. Another major factor is that this technology cannot be operated in populated areas, so that helps reduce the contact between the drone and the general population. One more factor is that you have limited flight time and a small area of operation because of the sightline constriction, so if you are at all cautious, you can limit the exposure to populated areas. Cost: These are not toys. You can easily have more than $10,000 invested in just the drone. Sub-systems can add even more. Additional costs include the training to fly it, as well as learning how to perform data capture, becoming proficient in imagery systems, pre-programming the flight path and setting waypoints for navigation. Finally, there is the necessary step to geo-reference photos or video. Ben Miller, a local government UAV guru from Mesa County, Colorado, estimates that he spends $25 per hour of direct operating costs, plus $100 per hour in indirect costs. While this is far cheaper than operating a small fixed wing aircraft, it is not inexpensive. A typical flight operation crew will consist of the pilot, an observer (to keep the UAV in sight), and a person who is checking the imagery or data being streamed to the ground station. Rules and Regulations: Now, you don't just go out and buy one of these things, start flying missions and all is well. It is estimated that at present, public safety departments in the U.S. have acquired over 200 UASs. Fourteen are actually in operation. The issue here is that for a local government to actually fly UAVs, it needs a certificate of authorization (COA) from the FAA. These are good for a year and can take several months to obtain. The approval process for a COA can be substantial. The FAA imposes restrictions based on the type of airspace in which you intend to fly. If you are in a major metropolitan area, the airspace is controlled from the ground. If you are in the “boonies,” controlled airspace may begin at 700 feet above ground. In addition to the line of sight limitation, and the altitude limit of 400 feet above ground level, you have to be five miles from an airport. Training is a key part of operating a UAV. Of course, there are a number of vendors to help you with that issue. There are a number of changes coming from the FAA. Next year there will likely be a better defined process for authorization and the skills needed by those who fly these things. So what do you do while the rules and regulations are all being sorted out and while you are pondering the uses you would have for one of these? Well, radio controlled (RC) model aircraft have very similar restrictions, such as the 400-foot altitude limitation and line of sight control. However, they don't require the certificate of authorization. RC aircraft are sold in many types of stores. If you are a “techy” and want to get ahead of the curve, go to your hobby shop, the mall, even Barnes and Noble, and check out what you can buy off the shelf. You can learn to fly on your own, even take photos and video on a UAV for less than $100. But, you can't use it as anything other than as a hobby. Make no mistake, drones are coming and you may want to be part of the game.